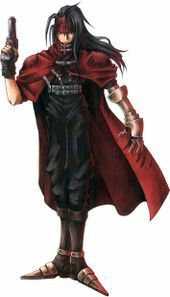 Character information for Vincent Valentine, a protagonist of Final Fantasy VII. Included are his background, stats, and limit breaks. Vincent Valentine is one of two optional characters. He is a mystical man, serious and upright, dark and mysterious. His past connection with Shinra Electric Power Company is what made him join Cloud and the others. He may seem weak at first glance, but he hides a fearsome power deep inside his body. In the previous Final Fantasy titles, the black mage is a job for characters with high magical attributes, moderate dexterity, and very low strength and health points (HP); a black mage stays at the back row and attacks with long-ranged spells. Vincent corresponds perfectly to this characterization, due to his own attributes and he is also using shooting type weapons instead of black magic. Chaos 4 Chaos Saber: Fire damage to all enemies Satan Slam: Attempts instant death, then does fire damage to all enemies Waterfall by the lake.